For two weeks in Spring 1934, the tenants of the first council estates in Leeds waged a rent strike against their Labour councillors. The cause of this rent boycott? Labour’s decision to raise rents while letting homes rent free to slum dwellers. Driven from their former allegiance by this attack on their privileges, the tenants of the first council estates rebelled against their socialist leaders. In the process they created a new recognisable political movement: a movement which plays a major role in housing policy today. This study of the 1934 Leeds rent strike presents an analysis of the birth of the council tenants movement . Far from being a creation of the privileged artisan class, as it is traditionally portrayed, the tenants movement was born out of a class identity crisis. The first tenants associations aimed to impose cohesion on a section of the working class which was disintegrating under immense social pressures. The early council tenants associations were created by a sector of the working class emerging into a new post-First World War world. The 1920s saw the development of a semi-skilled service economy and an economic depression which eroded the wages and status enjoyed by the skilled crafts workers and artisans. But the isolation of the new council estates in the remote suburbs of the city imposed a unique set of pressures on their working class tenants. They were faced with high rents, high living costs, and hostile neighbours and found their skilled status undermined in the economic depression. Their own aspirations to suburban living, whether that was seen in terms of middle class ambition or in terms of labour movement self-achievement, foundered under these burdens. A gradual change came over the social make-up of the estates. Skilled craft workers became white collar clerks, or found new forms of economic freedom in the booming sales sector. They found shelter from the upheavals of the depression in semi-skilled jobs in the post office, tram, rail and bus services. Or they found themselves unemployed and no different from the sections of the working class they would once have despised. A change of housing policy in the 1930s exerted even greater financial pressure on this already struggling sector. 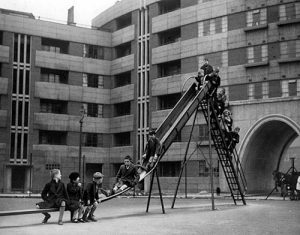 Council housing became a vehicle for slum clearance with estates designed as an intensively managed laboratory for social welfare experiments. Housing subsidies were withdrawn and redirected in the first form of housing benefit. Existing council tenants found their rents raised and even doubled and had to submit to a means-tested rent rebate process which brought nearly every tenant into the welfare system. The tenants associations and the Leeds Federation of Municipal Tenants Associations had acted since 1920 as a form of political representation for the isolated council tenants. They campaigned against high rents and high travel costs and sought representation for tenants in rent setting and housing policy. They also acted as the upholders of an aspirational value system: protesting against planning decisions which would undermine the quality of life on estates, championing the suburban belief system of “the Englishman’s home is his castle”. Their social activities acted as a social adhesive against the strain of the disintegration of class distinctions. The 1934 rent strike was the first time the council tenants movement came out in serious opposition to its local authority landlord. Their rent strike was a return to the confrontation politics of the early 1900s only this time the weapon was not being used against private landlords but against a political party wielding the power of local government. Denied consultation and excluded from policy making, the tenants movement launched a campaign of civil disobedience which failed because of the divisions within its own sector. The bonding of its social adhesion was ripped apart by the jealousies and rivalries stirred up by the rent rebate means test. The tenants could not act as a united force. They were divided by income, social status, and individualism and could no longer maintain the pretence that they were an elite group at the top of their social scale. All they had left was the shared identity of being defeated council tenants. Their defeat in the rent strike caused the council tenants movement to shed their traditional allegiance to the Labour Party and show themselves an independent force capable of affecting the balance of political power in the city. They created the modern tenants movement, a force representing a marginal and unique social group – the council tenant. A collection of different aspirations, a mixture of welfare and work, a section of the working class without class cohesion but with consciousness of their identity as council tenants. “The whole system seems to be turning round,” said T.H. Gilberthorpe, president of the Leeds Federation of Municipal Tenants Associations, when he heard his new Labour council’s plans to let homes rent free to families from the slums. At a meeting of the Leeds Housing Committee in January 1934 the Labour leadership set out their plans to raise council rents to an “economic” level while introducing a complicated rebate system to enable the rehousing of an anticipated 30,000 households from slum clearance. It was the beginning of a completely new approach to social housing – a switch from the public provision of general needs homes to a policy which saw council housing as a welfare safety net for the poor. The cost of rehousing slum clearance families was to be subsidised by every council tenant with an income above bare subsistence level. “One has sympathy with people who have fallen on hard times but why should the burden of their rent fall only on other municipal tenants?” Gilberthorpe asked. “Why not ratepayers?” (YP Jan 22 1934). It seemed a reasonable question to tenants who had forgotten – if they ever knew – that the new council estates had been subsidised to keep rents down. That subsidy was now to be removed and given only to households who could prove they needed it. For council tenants who were struggling to pay the current rents and who had made sacrifices to create their new lives in the isolated suburban estates, it seemed they were being punished for their aspirations. The plan announced with missionary zeal by Leeds Labour Housing spokesman Rev. Charles Jenkinson was to demolish 30,000 of the worst back to back housing in the city within six years and build the same amount in new council homes to rehouse the displaced population. To make this possible, differential rents would be brought in from April 1934 to 5,700 council houses. Rent rebates would be granted to families according to British Medical Association nutritional guidelines on the evidence of a regular means-test of their total household income. A new housing management department was to be set up to run the city’s council’s rapidly growing estates, with estate management officers, home inspections, and gardeners to teach people how to maintain their lawns. The management of public housing – previously left to the disinterested attention of the City Engineers and Finance Department – was to become “a sanitary and welfare operation with its over-ruling idea of improving the poor'” (Ravetz 1974 p10). Labour’s bold slum clearance plans had been clearly set out in their manifesto – as had the new rent system – and their majority of four in the November 1933 council election gave them the mandate they needed. Their policies were in line with the Coalition Government’s: the differential rents were allowed under the 1930 “Greenwood” Housing and Slum Clearance Act which set out the new role of council housing. Leeds, however, was unusual in applying the differential rents to their existing homes and in setting the rebates to allow the poorest families to live rent free. “The Slum Problem can only be solved by the creation of houses for the present slum population at rents which that population can pay” wrote Charles Jenkinson, noting that even the subsidy to Leeds council houses “left those rents hopelessly out of the reach of hundreds of thousands of families” (Jenkinson 1931). But when the new economic rents were announced in February 1934, council tenants were faced with paying twice as much as before. “It is outrageous,” was the first reaction of Tenants Federation president, T.H. Gilberthorpe. “I am confident that the people on Leeds estates will not pay the new rents. They will not stand for it and I am certain they will expect the Federation to fight it for all they are worth” (YP 17 Feb 1934). To apply for rebates from these doubled rents, the tenants were faced with answering a list of searching questions: income of family members, name and address of employer, details of lodgers and their payments, pensions, benefits and unemployment pay. Out of 5,000 tenants affected by the new rents, 4,800 submitted to the means test and applied for rebates (YP March 20 1934). But many refused to apply even if the new economic rents were far beyond their means (Citizen March 23 1934). The tenants’ protest began on the most select of the new council estates. Hollin Park had been built next to the leafy suburb of Roundhay causing outrage among the neighbouring middle classes. 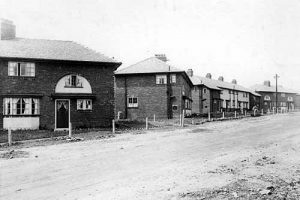 It’s 350 houses, initially intended for sale or rental purchase, soon gathered the reputation as homes to the most upwardly mobile of tenants (YP 31 July 1926). While other estates had set up tenants associations within months of the first families moving in, Hollin Park had remained aloof. It took Labour’s rent scheme to shatter their individualism. Tenants called a public meeting and sent a petition round the estate protesting against the new level of rents. “The economic rent is more than would be required to buy a bigger and better house in a good residential district,” they argued. “If the economic rent is persisted in it will have the effect of driving away the best paying tenants and eventually the houses will have to be filled with people who have to have their rents subsidised” (YP March 2 1934). The Hollin Park petition, signed by 250 tenants, set out arguments against the new rents which were to be repeated across nearly all Leeds estates (YEN March 13 1934). The houses were not worth the money – they had deteriorated rapidly since being built and were now in a bad state of repair; the tenants were already unfairly discriminated against by being forced to pay higher travel costs to their distant suburban homes than other workers; and why should the cost of subsidising slum clearance fall on council tenants alone? In response, Housing Committee chairman, Charles Jenkinson and Labour leader A.M. Dobb mounted a speaking tour of the estates, coming up against a barrage of heckling in each meeting room. Jenkinson refused to tolerate interruptions and insisted on absolute silence while he recited a one and half hour speech on the history of housing legislation and the ethics of corporate life, and ended by urging a spirit of sacrifice among tenants. In the face of tenant hostility Jenkinson was forced to moderate his original plans. His concessions meant that insurance premiums, hire-purchase agreements, trade union dues, school meals and school travel costs would be taken into account when means testing the family income (YP March 12 1934). It was a capitulation to the marginal status of the old labour aristocracy, to the artisan class that had once helped to bring Labour to power. Labour was confident that council tenants would come to accept the new rents and rebates system over time. They thought that tenants were their natural allies and that tenants associations would never challenge a Labour council. They thought wrong. Labour had seen tenants as their supporters, and tenant struggles as an ideal vehicle for pursuing a socialist agenda, ever since the 1914 Leeds rent strike, when the Party organised a city-wide protest against high rents. Labour councillors had campaigned ceaselessly for public housing, championing the interests of the artisan class by calling for homes at rents affordable to the labour aristocracy. 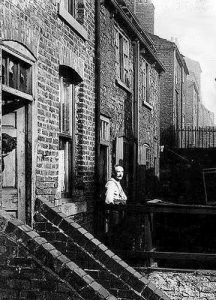 When Leeds Conservative council began building the first social housing estates with government subsidies under the 1919 Addison Act , Labour attacked rent levels which were “much more than the tenants could ever afford to pay” and forced through a reduction in rents (Citizen Feb 18 1921). As the first suburban council estates began to take shape – among fields and muddy half-built roads two miles from the city centre – Labour championed the tenants in their continuing protest against rents. The first council homes built with government subsidy had just been intended as a short-term intervention in the housing market to provide homes for returning ex-servicemen. Labour maintained that it was the role of the local authorities to build public housing – not as a temporary intervention in the market – but as a basic public service for “the workers and the lower middle classes who for various reasons are unable to provide houses for themselves”. The Leeds Labour Party pledged: “The task of housing these sections of the community should be the sacred duty of any government which happens to be in power” (Citizen May 19 1922). Labour attempted to mobilise both the existing council tenants and those on the waiting list for the new estates, to build mass support for their public housing campaign. With less than a 1000 more houses to complete in the Addison programme, and 7000 families waiting for them, Labour demanded that the council build at least another 2000 homes (Citizen Sept 29 1922) while arguing that those already housed in the new estates would benefit by reduced rents if more houses were built (Citizen March 23 1923). Although calling for slum clearance as well as for public house building, Labour at that time showed no deviation from its support for general needs housing. Indeed when in October 1922, Labour’s housing spokesman, Councillor Armstrong, called for a major extension of the Middleton estate, he said homes should be provided by the council at rents of 9/6 a week (Citizen Oct 13 1922). This was only a slight reduction on current rent levels and at least four shillings more than any of the unskilled working class living in back-to-back slums could afford (MoH 1926). Many of the new council tenants and those tenants waiting for a scarce council home had been involved in the labour movement, either as trade unionists or Labour Party members themselves. There continued to be a close link between the emerging tenants associations and the Labour Party. In September 1922 tenants leagues, trade unionists and co-operative society members sent delegates to National Labour Housing Association Conference in Southport. Many of the resolutions reflected the concerns of the new tenants over the design of their council homes and the high travel costs (Citizen August 25 1922). Council tenants regularly wrote into the Labour Party’s newspaper The Leeds Weekly Citizen and at the Labour delegates meeting in Leeds in Spring 1923, there were speeches against high council rents and system-build techniques on the new estates (Citizen 3 March 1923). Over time, however, Labour’s twin policies of supporting council house building for the skilled working class while campaigning for slum clearance proved incompatible. By the mid -1920s it became clear that the new suburban council estates would never be accessible to the poorest section living in the squalor of Leeds “unsanitary areas”. In 1927 Medical Officer for Health Dr Jervis first noted: “Unfortunately the class of individual going into these new houses is not the class that stands most in need of improved conditions” (MoH 1927). The tenants of the city’s designated unsanitary areas could afford rents of no more than 6/ while the new council homes, with rents of 9/ upwards, were too expensive even for the skilled artisans and clerks who had taken them. In the second wave of public house building, sanctioned by the 1924 Wheatley Act, Leeds Conservative council reduced the room sizes of the new homes and built family flats, which allowed rents to be reduced to a starting point of 7/ for a two bedroom house or 4/ for a two bedroom cottage flat (Finnigan 1984). This still had no impact on overcrowding in the slums. Larger families wanting to move out of the back to backs would be faced with rents ranging up to 12/6 a week for a three bedroom parlour house on top of the high travel costs to the suburban estates. Dr Jervis had been leading the campaign to clear Leeds slum back-to-backs valiantly and sometimes single-handedly for a decade and he became convinced that only a complete change of housing policy would solve the problem. “For all the thousands of new houses erected the slum population has not diminished by so much as one family” he concluded (MoH 1930). The 1930 Housing & Slum Clearance (Greenwood) Act gave national recognition to the slum problem and the failure of the previous waves of social house building to make any impact on it. It brought in the first rent rebates and signalled the end of subsidised general needs housing and the launch of the welfare safety net for subsidised tenants. 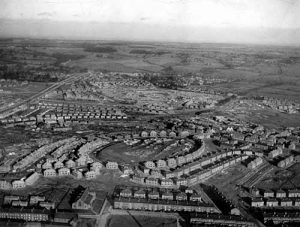 This reversal of previous housing policies found its echo in Leeds when the Improvements Committee published a report into future house building, stating: “It is neither fair nor desirable that a portion of the population other than dispossessed slum dwellers should be housed by a perpetual subsidy” (LCC November 1932). Guidelines from the Ministry of Health in May 1933 spelt out the total switch to welfare housing when they stipulated that tenants who could afford it should be charged higher rents and encouraged to move out and buy their own houses (Jenkinson 1934). Differential rents could be charged for all council houses built under the Wheatley and Greenwood Acts. This was to be extended in 1935 to include the first council houses built under the Addison Act. Labour’s new Housing spokesman, Rev Charles Jenkinson, embraced the government agenda with total dedication, born out his knowledge of the slums of Leeds and a personal crusade for public welfare and public decency. Before Labour’s return to power in Leeds in 1933, Jenkinson campaigned energetically to create a moral agenda for mass slum clearance. Slum housing creates a slum mind, he claimed. Slum children are mentally and physically warped, reared under a deadening depression, where ordinary decency is impossible. (Jenkinson 1931). From now on, council housing in Leeds was to serve a moral purpose – raising standards of behaviour among the slum class while preventing the spread of disease. The residents of the slum back to backs – the future tenants of council housing – were noticeably voiceless and faceless in Labour’s plans for Leeds. The existing tenants – Labour’s former aristocracy – had a voice and a face but were now standing in the way of progress (Citizen March 9 1934). This divergence between the Labour Party and the tenants who were once its vanguard was accompanied by – and no doubt related to – the development of an independent organisation for council tenants in Leeds. Scarcely a year after the first tenants moved into their new homes, they were forming tenants associations on the estates to campaign against high rents. As isolated organisations they had little impact. Hawksworth Wood Tenants Association was refused permission to petition the council for a rent cut. Only Labour councillors supported its right to be heard (Citizen Feb 3 1922). So the tenants associations banded together and forced a deputation on the Housing sub-committee claiming that rents “were now unbearable as a result of a serious fall in wages” (Citizen March 3 1922). The City of Leeds Federation of Municipal Tenants was formed out of the need for common cause on the rent issue. It first appears in August 1923 armed with a 2,300 signature petition for a rent cut, and including delegates from all Leeds tenants groups except the Crossgates association (Citizen August 3 1923). This was a well resourced and assertive tenants federation. Its spokesman, Mr Green presented a lucid case for a rent reduction to the Improvements Committee. Green’s presentation was a well-judged argument, referring to case studies of comparative private sector rents and using the government’s own criteria for rent setting to prove the Federation’s case. In addition, he asserted the right of council tenants to be consulted in the rent setting process, calling for the Federation to be given representation on the rent tribunals. Labour gave the Federation their full backing. “A man with a parlour house must spend at least 18s per week for the privilege of living in one of our houses and at present wage rates it must be confessed that the strain is too heavy to be borne,” argued an editorial in the Citizen. And in its usual pursuit of the tenant vote, the Labour weekly newspaper continued: “If corporation tenants really want reductions .. they will see to it that their votes are given to those who really have their interests at heart,” (Citizen Sept 7 1923). But the new Federation’s power as a voting block was not lost on the other political parties. When the Federation went before the Improvements Committee to continue their campaign in September 1923, their bid for a rent cut was supported this time by Conservatives and Liberals – both with eye on the November council elections (Citizen Oct 26 1923). The new suburban working class now had its own organisation – one that was able to attract support from all parties, but which could remain independent of all. This was matched by the growth of a clear and distinct agenda for council tenants – one which no political party could wholly embrace. High rents were only one of the issues concerning the council tenants organisations. Complaints about the poor quality of the houses had emerged as soon as tenants moved in and the lack of cheap public transport to the estates, together with the emerging problems of estate life created feelings of grievance which spurred on the Tenants Federation. The first tenants on Hawksworth Wood complained about the “cheap and nasty interior appearance” of the houses. After only a year on the estate, they had a long list of grievances. The hinges of windows made them difficult to clean, the glass in the windows was inferior, the skirting boards too narrow, the hot water cysten in living room an eyesore. The roads were still unfinished and “shopping means a flounder through the mud and then a tram journey” (YEP 17 Dec 1921). And only a year after they were thrown-up, some of the system-built homes on Leeds estates had already become so dilapidated that they needed complete re-roofing and rendering (Citizen Dec 7 1923). The first council tenants faced this catalogue of problems alone. Their experience as the first suburbanised working class was unique. Their homes were geographically isolated two or three miles out on the far outskirts of the city. There was little Labour organisation on the new estates. 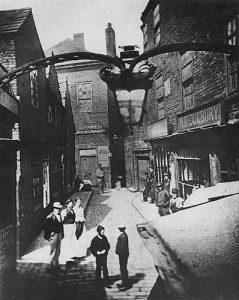 Labour’s ward activists and the society of the Labour Clubs was still focused on the inner city, and especially the back to back streets. Hawksworth Wood estate may have had a Labour Hut as a meeting place, but the Conservative Club was its first social centre. The novelty of their situation forced a separate political agenda on the Federation. Their concerns and campaigns became marginal to the housing strategies of the political parties, just as the estates were on the margins of the city. This can clearly been seen in the consultation organised by the council’s Improvements Committee in 1932 in its debates on future housing policy. 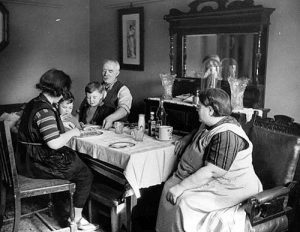 While the Ministry of Health, and the Leeds Labour Party focused the discussion on the need for slum clearance and all groups concerned themselves with the debates over future house building, the Federation was unique in talking of the experiences and quality of life of tenants in the existing estates. The City of Leeds Federation of Municipal Tenants Association was consulted by the Conservative-led Improvements Committee in a widespread consultation with housing interest groups, including estate agents, and the Leeds Property Owners Association. The tenants deputation commented on conditions on the estates, including fencing between gardens and complaints about the cramped living space for families in the new cottage flats. At the request of the Improvements Committee, the Federation carried out a survey of 112 tenants in the cottage flats. Out of the 84 who replied, the majority said they would prefer a house and found the flats too noisy or lacking privacy. The only advantage was that they were comparatively cheap ( LCC 1932). The majority Conservatives on the Improvements Committee responded to the tenants’ lobbying by recommending an end to the building of three bedroom cottage flats. The Labour minority on the committee published their own recommendations (Labour Party 1933). Making no mention of the Tenants Federation or its lobbying – they outlined a recommended programme of slum clearance, differential rents, house building and the building of new blocks of flats on clearance areas. This refusal by the Labour Party to listen to the views of tenants on the issue of flats fuelled a resentment which ignited in the rent strike year later (YP April 3 1934). “The Executive of the Leeds Federation of Municipal Tenants Association, without consulting its members, has begun a campaign of opposition to the differential renting project,” noted Labour Coun William Leach writing in the Bradford Pioneer in 1934. He went on to officially end the alliance between Labour and the tenants movement by accusing them of being Conservative stooges (Citizen March 9 1934). But it was Labour supporters on the south Leeds Middleton estate who called Rev Charles Jenkinson a “dictator” when he outlined the future of social housing to them that March. He told them that under his new Housing Department anyone with a spare bedroom would be forced to move to a smaller home. “These declarations fall strangely on socialist ears,” noted the Yorkshire Post eavesdropping on the mass meeting. The reporter recorded the tenants beliefs: “the principle of the rank and file instructing their leaders finds more favour” (YP March 12 1934). In those depression years, it seemed as if the Leeds Labour Party was applying the same demeaning policies to council tenants that the national government applied to the unemployed. The new rent rebates depended on a means test of family income every bit as intrusive as the means test for transitional benefit which the labour movement nationally was campaigning so vigorously against. The despised Means Test was being debated in the Commons as part of the scrutiny of the Unemployment Bill, and tenants on the estates were quick to draw the comparisons. “Why does the Labour Party denounce the Means Test for transitional benefit and create one for rent relief?” Jenkinson was asked at Middleton. His answer, that he was merely obeying the 1930 Housing Act , satisfied no one (Citizen March 2 1934). The new rent system and the whole shape of council housing envisioned by Leeds Labour Group ran counter to many of the traditions of its tenant allies. There was to be no room on Jenkinson’s estates for tenants who could afford to move. They were to be driven out: “The quicker people purchase other houses the better will the Corporation be pleased, ” he told Hollin Park tenants (YP March 12 1934). Speaking at the Association of Municipal Corporations conference, Jenkinson spelled out his vision of social housing. “All subsidised municipal houses must sooner or later come to serve one single purpose, the housing needs of those sections of the populace who cannot afford to pay the rent of a privately-owned house” (YP March 17 1934). The tenants associations and their members could have been forgiven for starting to feel unwanted. And now it seemed that Labour didn’t even want their votes. On the Osmonthorpe estate – a safe Labour seat – Jenkinson got such a angry reception from tenants that he sat down until the shouting subsided. When he got back to his feet, he told his 1000 strong tenant audience that those who did not like the new rent scheme “should vote Conservative at the next election” (YP March 15 1934). The Hollin Park tenants – already living in the Conservative Roundhay ward – needed no such encouragement. Their newly formed tenants association presented a petition against differential rents to Tory Councillors Sagar-Musgrave and Ives. “It is time that Jenkinson was made to understand that the people of this city are not going to be told what to do,” said Ives to the 200-strong crowd. (YP March 15 1934). Over that weekend, 17 to 18 March 1934, 4000 tenants in Leeds were served with a notice to quit. If they wanted to stay on in their council tenancy they had to accept the new rents. Many of them received the bad news of a 100% rent rise in this terse message from new Housing Director R.A.H. Livett: “You are in a position to pay the full economic rent. I forward herewith notice to quit. If you are desirous of continuing to occupy at the new rent, the corporation will be prepared to accept you as tenant on that basis” (YP March 20 1934). As the notices to quit dropped through letterboxes, people went house to house on estates in Bramley urging rent strike (YEN March 19 1934 ). It was clear that the council tenants were not going to be told what to do after all. Leeds Federation of Municipal Tenants Associations, which claimed a membership of 7000 tenants, carried out a door to door ballot across 9 of the city’s 11 estates to consult their membership on the new rent scheme. A total of 2,284 ballots were returned with tenants voting 1,667 to 617 against differential rents (YP March 31 1934). The Federation’s secretary, James Jenkinson argued that the survey gave them a mandate for resistance. “Cross Gates where there are 92 houses, voted 100% against,” he reported. “Greenthorpe with 216 houses, had a voting return of 165 and Hawksworth with 85, returned 72. Middleton with approximately 3000 houses, returned nearly 1000. In my opinion, at least 80% of tenants affected are opposed to the scheme” (YP April 2 1934). Following this ballot, the Executive committee of the Federation took legal advice before publicly urging its members to refuse to pay the new rents. Its leaflet to all tenants stated: “If since receiving your new rent assessment you still condemn the scheme of differential rents, this circular is of the utmost importance to you. What are you going to do about it? Will you follow the lead of the Federation?..The Corporation cannot distrain your goods or eject you without an order of the court. We are of the opinion that the corporation have a moral obligation to their present tenants and we also contend that the subsidies were paid by the government to build houses and not to individuals”. Each leaflet had a tear-off slip for tenants to hand to the rent collector : “Dear Sir, I the undersigned being the occupier of ……hereby state that I do not admit the validity of the notice to quit. I also beg notice that it is my intention to tender the usual sum.” (YP March 31 1934). Meetings of tenants associations endorsed the Federation’s campaign of rent strike. Tenants in Middleton voted 148 to 8 in favour of joining the Federation’s struggle. Mr W. Lancaster, president of Middleton Households Association, told his audience at the meeting that the Federation had been refused permission to meet the Housing Committee to discuss the rent scheme and that withholding rent was the only option to tenants denied the right of consultation. “On Middleton estate they were saddled with a non-parlour house that was incorrectly called a 3 bed house, whose doors were warped and whose windows let in rain. These were houses for which they were asked to pay 13s9d a week,” Lancaster told the crowd (YP March 31 1934) . Voicing the Federation’s opposition to Labour’s whole housing policy, and especially their plans for building flats, he accused the council of creating what would become the slums of the future. Rent collection was carried out door-to-door on Mondays. The first day of the rent strike – April 2 1934 – fell in the middle of the Easter holidays. The Federation had instructed tenants to hand over the amount they had been paying before the start of the differential rent scheme. This meant that some of those tenants receiving rent rebates were being asked by the Federation to pay more than they now owed (Times April 3 1934). It was a recipe for confusion on estates where tenants were already deeply divided. The immediate effect of rent rebates had been to split the tenants movement. Many tenants on the estates were not affected by the differential rent scheme at all because they lived in the 3,000 early Addison houses which were excluded from the first year of the scheme. The 5000 tenants affected by rent differentials were divided into those who were now living rent free, those who had their rent reduced and those whose rent rose or even doubled. The decisions of the committee of three councillors deciding on every request for rebates were often obscure. In one case quoted in the Yorkshire Post , family A: a man, woman and five children with a total income of 36s received a full rent rebate and so had nothing to pay. In another case, family B: a man, woman, and four children, with a total income of 38s had to pay their full economic rent of 8/4. When queried, the committee justified this decision by saying that because the man in Family B was self-employed there was no way of checking that his statement of income was correct. His family was therefore not entitled to rebate (YP March 19 1934). Decisions like this and others in the 500 cases dealt with each day with the committee, spread resentment across the estates. Neighbour began informing on neighbour, claiming that they had lied in their means test. He said: “It has led to constant bickering and a general feeling of un-neighbourliness. It has been most marked at social functions, such as whist drives, held at various tenants associations. Formerly neighbours lived amicably together – disclosed to each other their troubles and hardships. Now the whole atmosphere is changed, and you hear whispers of conversation such as ‘they don’t know his full income’ ” (YEN April 3 1934). So it was to a membership already deeply divided and mistrustful that the Federation issued its confusing instruction to pay only the old rent. When the rent collectors had been and gone that April Monday, the Federation’s first hopeful estimate was that 2000 had come out on rent strike. On James Jenkinson’s own estate of Greenthorpe, 100 out of 216 households had refused to pay. By the Friday, however, it was clear that only somewhere between 400 and 500 tenants had followed the Federation’s call (YP April 7 1934). Labour’s Housing Committee held a special meeting at the end of that first week and issued possession proceedings against all tenants on rent strike. New seven day notices to quit were sent out by registered post. The blunt demand read: “As you have not accepted the offer of a new tenancy, I have received instructions to proceed to recover possession of the premises in your occupation. If the premises are not vacated by you on that date, possession proceedings will be instituted without further notice and the corporation will seek to recover possession with costs, plus the full economic rent for the period of your occupation after the expiry of the notice to quit” (YP April 9 1934 ). The legal threats were accompanied by insults in the press. Labour Group chairman G. Brett accused the Federation representatives of being rich parasites. “Let those in revolt state their occupations, their incomes and all the other facts and I have no fear of where public opinion will be. These “high-souled” revolters who have been accepting public subsidies for years have not the slightest ground for complaint let alone revolt.” (YP April 5 1934). Housing Committee chairman Charles Jenkinson echoed these comments, when he accused the rent strikers of “asserting their right to receive housing subsidy for ever at the expense of the taxpayer and ratepayers” (YP April 7 1934). “The war is now on,” said Federation secretary, James Jenkinson. In a letter to the remaining rent strikers he urged them not to be intimidated. I want to be appeal most earnestly to our members to maintain a solid front,” he said. “We are prepared to continue our resistance to the furthest limit.. The real battle has now begun in deadly earnest and I want to urge all tenants to maintain a fighting attitude” (YP April 7). On Monday 9 April 1934 the rent collectors refused to take any money unless the tenants paid the full amount of the new rents. As they made their way around the estates, it became clear that the strike had all but collapsed. When all the returns were in, Charles Jenkinson announced that the number still refusing to pay had fallen to 60. The strike had lasted two weeks. Federation secretary James Jenkinson signalled the surrender. “My thanks and gratitude to those tenants who have the courage to fight to the bitter end. They know as well as I do that the people who have paid the new rents under protest run into hundreds – indeed into thousands. Their attitude to Rev C Jenkinson and his party’s policy has not changed. They have merely been threatened and intimidated and they have had to pay up to save themselves from being turned out on the street. I do not blame them. I am not even an opponent of differential renting. Our quarrel is with the manner it is being applied in Leeds. We as shareholders in these municipal houses have a right to express our convictions through the ballot box. We shall do so in due course,” (YP April 12). It was in the courts that the Federation were first to contest Labour’s housing policy. Rev Charles Jenkinson had already written privately to the Federation secretary inviting him to use his own situation as a test case. The Federation now briefed legal counsel and opened a defence fund to pay their court fees. The battle would now be waged in the courts as James Jenkinson took on Charles Jenkinson over the legality of differential rents. In a letter to the remaining rent strikers, the Federation urged them now to pay up and wait for the decision of the test case. Enclosed was a form to be handed to the rent collector: “I make this payment under protest and do not admit the right of the corporation to charge me with the additional rent and I reserve all my rights in this matter” (YEN April 12 1934). The Labour Citizen crowed in premature victory: “The so called great revolt of Corporation tenants encouraged by the Tory press and by political propaganda has ended in miserable and humiliating collapse” (Citizen April 13 1934). Federation secretary, James Jenkinson lived in a two bedroom house on the Greenthorpe estate in Bramley. His new economic rent was 13s11d compared to the previous 9s8d. Jenkinson, a commercial traveller, had not claimed rent rebate and now he continued to withhold payment of the new rent as he prepared to fight the battle alone. A summons for possession was served on him on April 17 and the case was heard in Leeds County Court before Judge Woodcock. Raymond Hinchliffe, the Federation’s solicitor argued that there was no provision under law for rent rebates and that the differential rent scheme was illegal. On May 14 Judge Woodcock ruled in favour of the Corporation. The Federation’s decision to appeal against the ruling brought them messages of support from tenants associations across the country. The National Council of Corporation Tenants Associations gave their backing (YEN May 25 1934). Council tenants were now seen as a campaigning force that could seriously shake the local authority. Even though the Appeal Court ruled in October 1934 that the local authority had the discretion to set differential rents, the Federation had succeeded in raising their dispute to a national level and making the voice of council tenants heard. Their power as voters was next to be tested. The Conservative Party in Leeds had made greater inroads into the council estates after their first successful hearing at Hollin Park. In April they had drawn council tenants to a meeting in the Kirkstall ward in north west Leeds to hear the party’s view on housing issues (YP April 12 1934). Later that month, Dewsbury Road Municipal Tenants Association was asked by Beeston Ward Conservatives to arrange a meeting of tenants in south Leeds. The meeting at St Anthony’s School was disrupted by Labour Party members who were ejected and protested outside. Only Conservative Party members or tenants who could produce a corporation rent book were allowed in. Conservative chairman, Alderman CV Walker seemed to represent the tenants views when he said: “Housing estates were not intended for slum clearance schemes. Housing estates were built to assuage overcrowding and to meet a need of returned ex-servicemen…Large numbers of people earning quite good wages have been compelled to submit to a means test and apply for public assistance who are not, and never should be, the object of public assistance and should not be brought within its ambit ” (YP April 18 1934). The extent of the tenants’ switch of allegiance from Labour to Tory was revealed in the November council elections. Conservatives scored highly in Potternewton and Hawksworth estates and Labour lost their seat in the “safe” Osmondthorpe estate ward (YEN Nov 2 1934). Their majority over the Conservatives on the council was reduced to two (Citizen Nov 9 1934). The following year, the Conservatives won back Leeds city council control and brought in a new rent policy. Rent on the council estates remained a key election issue until the start of the Second World War. Labour portrayed them as well-off parasites, living off public subsidies and stealing scarce resources from the poor. To the Conservatives they were sterling examples of the “thrift and pride that still exists in the British working man and woman of today” (YP March 13 1934). So who were the Leeds rent strikers? The first council tenants to move onto the Hawksworth Wood estate in 1920 all brought their pianos with them (YEP 1 June 1920). The piano was the ultimate status symbol of the aspiring working class (Roberts 1971). An instrument associated with middle class values, and with the gentility and marriageability of women, it is significant that each of the new tenants gave the piano pride of place in their living rooms. The piano crops up again as a symbol in the middle of the 1934 rent strike. Federation secretary, James Jenkinson is seeking to expose the effect of rent differentials on workers with a war disability; the trades he uses as an case study are those of a piano tuner and a piano teacher (YP April 5 1934). There were no piano teachers or tuners on Jenkinson’s Greenthorpe estate so why did he chose this example? Perhaps he was writing in the front room by the piano – we’ll never know. By the 1920s the piano was no longer the preserve of the better paid artisan. Instalment payments had brought this status symbol within reach of most homes. To Roberts, this was an example of the blurring of the social layers in the 1920s caused by mass unemployment and of the new assertiveness of the post war working class. “A new generation was establishing itself, …more aware, better educated and growing more certain of its rights and needs …the children of the undermass were mute no more,” he writes in “The Classic Slum” (Roberts 1971 p193). Others have argued that the piano was a symbol of the desire for self-improvement which characterised the labour movement and socialist groupings of the 1900s ( Defoort, Campbell, and others H-Labour 1999). The symbolism of the piano proved as changeable and uncertain as the position and aspirations of the council tenants. The piano – once a safe hallmark of middle class aspirations – becomes a sign of all the changes in social status, beliefs, and aspirations which were transforming the working class in the post war years. Throughout the late 1920s and 1930s, the first council tenants were seen as members of the artisan class, prosperous and skilled manual trades people or the lower middle class, clerks, and sales people. These, it seemed, were the only people who could afford the rents and travelling costs of life on the estates. The first council estates “institutionalised for the working classes the process of suburbanisation which the middle classes had followed since the middle of the nineteenth century” ( Burnett 1978 p234). Their middle class location suited the aspirations of the tenants. Values of “the suburban lifestyle of individual domesticity and group-monitored respectability” (Thompson 1982 p8) soon appeared on the new council estates. The tenants associations were the chief proponents of these values, illistrated by the attempt in 1923 by Crossgates Municipal Tenants Association to prevent the opening of a fish and chip shop on the estate. They argued that people throw the bones and paper into the gardens of houses as they pass (Citizen Sept 28 1923). The Federation’s oppostion to council flat building was based on a true suburban sentiment of the domestic sanctuary. “A flat does not come within the ideal of the Englishman’s home being his castle,” the Federation said. “They are not exactly the type of dwelling likely to elevate the standard of the people living in them” (LCC 1933). The established middle class of the suburbs fought the development of council estates which they saw as lowering the tone of their neighbourhood. During a public inquiry into the plans for the Hollin Park estate, 63 owners of adjoining properties signed a petition saying that the homes would be a threat to the amenities of the neighbourhood and reduce the value of their property. The Town Clerk called it “a deplorable thing that a scheme to carry the working classes out into that lovely and pleasing spot should be opposed…The repose which these gentlemen apparently consider their more or less exclusive right”(YP May 22 1925). Not long after being built, however, Hollin Park estate seemed to have acquired the same values as its snooty neighbours. It was called “the estate where ‘self’ rules” (Citizen March 23 1934). Council estates were seen as home to a “what would the neighbours think” suburban mentality. “It is a pitiful tragedy that there still remains this striving among members of small housing communities of trying to create a better impression than the more fortunate folks next door. It is this feeling more than anything else which is antagonising the members of the various council estates,” wrote the Citizen (Feb 23 1934). The divisions caused by the means test were deepened by the aspirational values of council tenants. Some tenants refused to apply for rebates because they didn’t want to reveal their poverty. Others were pretending to a financial status that they couldn’t sustain. “Lay your cards on the table and be frank about the matter and some of you may find a welcome reduction to be your portion,” Labour told them helpfully (Citizen March 23 1934). It was these divisive effects of the means test which the enraged the Federation more than anything else. James Jenkinson testified to the ill feeling and rivalry which now dominated their Tenants Association whist drives. People were informing on their neighbours. Labour’s Housing Director received a series of letters from tenants making accusations against others on their estate. They saw Labour’s housing policy as a direct attack on the aspirations and values which the tenants associations sought to uphold. In an open letter to the press, secretary James Jenkinson asked: “Are we then unsuitable tenants? Definitely no! Do we not bear ample witness to the good judgement of those who selected us to occupy these houses? The average corporation tenant is a credit to the community… It may be that the fact that we are corporation tenants has enabled us to get good jobs” (YP April 5 1934). Some of those opposed to rent rebates clearly aimed to prevent the rehousing of families from slum clearance on the estates. Conservative councillors were not ashamed to made this an issue. 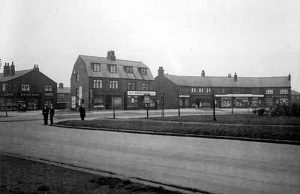 Councillor Ives said Hollin Park would become a “qualified Beckett Street institution” – referring to the Leeds workhouse (YEN March 13 1934). Alderman Davies claimed that “the shiftless, even the worthless shall be placed on an equal footing with others” (YP March 20 1934). In return the Labour Party claimed that all rent resisters were high-earners who could afford to buy their own home but preferred to live in a subsidised house. Rumours were spread that some of those applying for rent rebates on the Middleton estate earned £8 or £9 a week (YP March 31 1934). Their values were under assault. But were the rent strikers really such a privileged crew? A study of the employment listed for tenants in the Hawksworth Wood estate in Leeds in 1921 shows that the first council estates, built to fill a gap in the private housing market, provided homes to a curiously mixed bag of social classes. The first ten tenants on Hawksworth Wood estate were a paper salesman, a draughtsman, a coach painter, a moulder, an electrician, a labourer, a wheel turner, a clerk, a lithographer and a wood worker (Kelly’s 1921). Seven out of the ten households on this isolated estate were skilled artisans. A year later with around 200 houses built, the composition of the Hawksworth Wood estate had radically changed. Teachers, book-keepers, hairdressers, managers, tram conductors, travelling salesmen and insurance agents had become council tenants (Kelly’s 1922). The turnover of tenants on the council estates was a constant 10 -11% of households every year up into the 1930s. Most of the professional classes who moved onto council estates after the First World War quickly moved out once the house-building market recovered. Many of those who found the council rents and cost of living beyond them will also have quit and moved back to the private rented sector. In the second wave of house building, from 1923 onwards, council house building for sale promised to create what Conservative leader Alderman Lupton saw as classless estates (YP 31 July 1926). Over 400 houses were sold in Middleton, Meanwood and Crossgates estate (Rhodes 1954). At Hollin Park, 11 houses were sold before any were even built. “Such figures are eloquent of the eagerness of working class people to possess a roof of their own – an ex Lord Mayor of Leeds is one of those who are purchasing at Hollin Park” (YP 31 July 1926). Despite these early signs that subsided home ownership would be popular, it made little impact on the waiting list of nearly 70,000 for council tenancies. A rental purchase scheme designed for lower income households never attracted more than 360 buyers in total (LCC annual reports). Hawksworth Wood estate in north west Leeds was started in 1920 under the Addison Act and expanded in the next phase of building under the Wheatley Act. 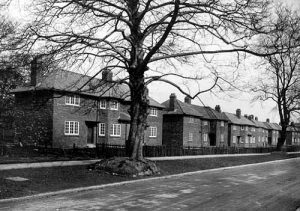 Greenthorpe estate in Bramley, south west Leeds, was built in 1927 under the Wheatley Act. An analysis of the occupations of tenants on the two estates over a decade shows a growing number of semi-skilled workers moving into council housing, or skilled workers becoming semi-skilled. The analysis reveals a switch from jobs in production to work in the service sector, tenants become door-to-door sales reps, or workers in the tram and bus services. There is a gradual increase in un-skilled workers and in households headed by lone women non-earners (Kelly’s 1932 & 1940) . The overall picture is not of council estates populated by the privileged artisan class but of a working class in the process of losing its skills, its differential wages and its separate identity. Far from being an elite among the working class, the first council tenants were a marginalised group shorn of their identity and deprived of their status. The remoulding of the artisan class, labour’s aristocracy, into a semiskilled, unskilled and insecure work force on the margins of the city, cut off from their traditional support networks and surrounded by a hostile middle class, created a unique new political force. The tenants movement was forged under the pressure of unemployment and de-skilling in the 1920s and 1930s. As well as campaigning against the high cost of living on the estates, and creating a structure of political representation for the isolated tenants, the tenants associations provided a bonding mechanism which challenged the divisive nature of the social pressures on the estates. The means test brought in by Labour in 1934 ruthlessly exposed the pressures on the council tenants. It tore apart their pretence at a shared sense of identity and class. Their resistance in the 1934 Leeds rent strike can be seen as a last ditch attempt to create a shared class consciousness among a rapidly disintegrating working class. The new housing policy which saw council housing as a form of welfare provision threatened to submerge them into the underclass. Council estates would be seen as ghettos of ex-slum dwellers and a council tenancy would be a statement of poverty. Through their rebellion they asserted the right of council tenants to be stakeholders in council power. Denied consultation, they took direct action. From that failure they turned to the courts. Losing in court, they took political action and finally defeated the Labour leadership through the ballot box. The tenants movement had lost its socialist allegiance, it had been stripped of its middle class aspirations, its members had submitted to a means test and become part of the welfare system, but it had exerted its power as an independent movement. They had made the city listen to the voice of council tenants.